Sharon B’s Worksheets: Stitch module 6 available at a special price for 7 days – Pin Tangle – Pin Tangle. The special price of $5.00 is only for one week. If you’re not familiar with Sharon’s Worksheets, her first four modules are available for free download so you can try out Sharon’s system. I think you’ll like what you see. Here is a link to the first four modules: http://www.pintangle.com/stitch-worksheets/ This page will describe the sheets and towards the bottom are the links to each of the four modules. 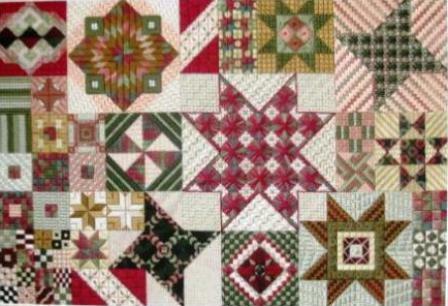 Click on this link and read an incredible article about how scraps of fabric were used to link mothers to the children they left in foundling homes. The first ort is simply a page of quotes that I would like to work into a sampler one day. Until then, I’ll just try to fit them into conversations! These won’t be your run of the mill sayings. I find inspiring or thought-provoking words in the books I read. I jot them down on paper to remember. I need some place to put them. Now I have a place. I had tried to put them in a file. I can’t remember where I put the file. I always remember where my computer is, though. So, when I find that file, I’ll add it to this page of orts and I’ll always know where it is. I’ll even share it with you! Anywhooo…I carry less than a quarter of the books we started out with and only a couple stitch guides, so I depend on the digital world a lot more. I love that there are more craft type books that are jumping on the electronic bandwagon, but mostly they are publishing for Apple devices. I don’t use Apple devices. Which brings us back to the topic. [I drive Jeff nuts with all my asides in conversation.] I bookmarked every website that had a good section for stitch instructions with clear, coherent images. Of course, I now have all that info mixed in with my bookmarks for cool shops and patterns on my wish list and who know how many other really super important reasons for bookmarking a site. As usual, I finally got smart and created a category for patterns I want, which has become a wish list for anything I want! My file for stitch guides is woefully small although I know I bookmarked at least 20 sites! So, I’m sorting orts. As find the orts appropriate for the pages, I’ll add them. As I find a collection of orts that need to be grouped and organized as a whole, I’ll add them, too. Maybe I can save you some grief from your ort sorting! Let me know if it helps! This past weekend, I “needed” to get some fibers for the ANG National nametag design I want to submit. We happened to be visiting my partner’s kids–the first time we’ve seen all the grandkids together! It was lots of fun to see the lifetime relationships begin to develop. But I digress! Click on pic for close up! I’ve always wanted to check out Expressions in Needleart as members of the Rochester EGA Chapter frequently spoke of “going to Lori’s.” It sounded like lots of fun as they would include going to lunch and visiting Suzanne’s shop, too. (She is an EGA member and has a shop devoted to rug making.) Canandaigua itself is a wonderful little community with fine dining and access to local vintners. If you love Victorian type villages, you must try to visit here. The buildings and main street make you feel like you’ve entered a different time and should be wearing billowy skirts and charming hats while looking for a trolley to take you back to the Spa. I wished I had a sketch pad with me so I could draw some of the building adornments that would look lovely in a piece of blackwork. It was exciting walking into the shop as the display in the windows got the drooling going. But even before that, the white adirondack chair outside the door grabbed your eye. It had a blue lake scene type painting on the lower part and was a prize in a community fundraising raffle. While there, a couple came in specifically to get tickets for the chair. They, surprisingly, needed to be reminded to put their on the tickets! Maybe their minds were boggled by all the goodies to look at, too! What especially caught my eye was the Kathy Rees pieces hanging on the wall. It was great to see Galaxy up close and personal. I so enjoyed watching Jan Sprague complete hers in a personal color scheme. Funny, but I thought the piece would be larger. Maybe it’s the name. 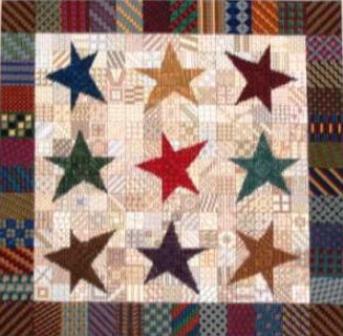 Another favorite Kathy Rees piece that I got to oogle was “Oh, My Stars.” That’s on my “wish list,” too. Lori had a wide variety of Needle Delight Patterns on hand. Lori also has all the threads you could possibly need to complete these and anything else you might have in your UFO pile. On top of that there are cool tools to choose from, too. If you’re like most, you have more than one craft love. If your other love is knitting, you’re in luck because Lori has a nice supply of knitting supplies and yarn to choose from as well. In fact, I am trying to learn Domino Knitting and must go back to Expressions in Needleart to pick out a nice heavy cotton to doodle up some Domino Potholders. So, the bottom line? Lori was no different than other shop keepers. When asked her favorite thread and color, she wandered around a bit. Then narrowed it down to silks, her favorite to work with. It was a toss up, but Gloriana won her over–for today! And the color? One of my favorite fruits–Granny Smith Green. That would be number 053 Gloriana. And the stitch? Well, lately Lori has been doing a lot of T Stitch. That’s cool, I like T Stitch. But that’s not going to be the stitch for 053 Gloriana. This thread is going to be dressed in style in the lovely Nobuko Stitch. I can hardly wait to stitch it. But this sampler is no where near ready to go. Until it is, I think I’ll work up a sample for my Stitch Guide Notebook that I started with the Stitches For Effect Class I’m taking through Shining Needle Society. (Although, I’m thinking I’d like to try Sharon B’s Stitch Worksheets model. 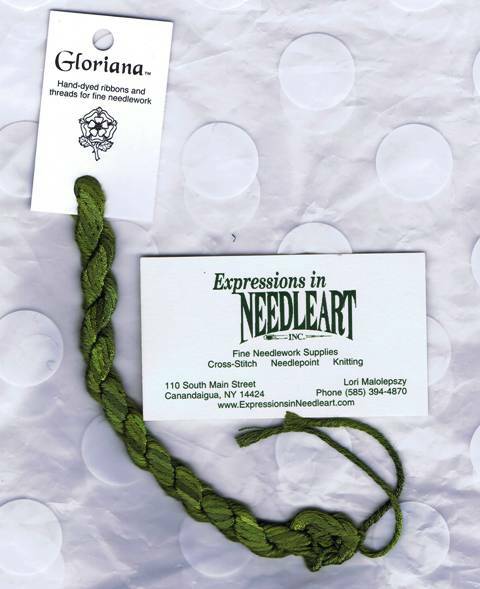 )When I get back to Expressions in Needleart, I’ll try to get photos of the shop if okay with Lori and post them when I post my sample of Gloriana 053 in Nobuko Stitch–unless you send a pic of yours first! I’m all over the place these days. I’ve got my three blogs I am trying to get beyond infancy. Only one is ready to walk, Blackwork Lessons. I’ve finally figured out just about everything I need for right now, except the tag and category stuff along with promoting. My site for the dogs, Sight Sniffing, is really still waiting to be born. I’ve gone through about four themes for that one, but I think the one I’ve settled on will work nicely. Now just to get into content which will be mostly photographic. I think the next step that is necessary for success is to develop a schedule of when I will sit down and update each blog so they each stay current. It’s hard to do because I am so focused on blackwork and design right now. That is not to say that I’m not doing other stitching. I am. But, I am committed to writing a book that will be called Blackwork Lessons. And my head is wrapped all around what the book will look like and include as well as getting permissions from other artists to be able to include some of their work because no one can do it better. Like the Skinner Sisters. I’ve just downloaded a new (to me) software (open source) that will allow me to use the same system Kim Brody Salazar uses and describes in her blog, String or Nothing. A little stuck right now, but tomorrow’s another day. Today I started a database on my Blackwork Lessons Yahoo group to list symbols found in stitching as I came across a couple Mayan references while reading the HandEye newsletter. Also wrote a note to self to start a database to include cool sayings I’ve found that would be great on samplers so I can finally throw all those little slips of paper away! And I need to start a poll to see if the yahoo group wants to have an online meeting in October. That’s when I had originally planned to unveil my own blackwork sampler creation. So, I haven’t been avoiding you, dear Shop Sampler! Just too disorganized to give you the time you deserve. I’ll be better. Promise!